11 februari 2019 door Nijkerk Electronics B.V.
GIGAVAC continues leadership in sealed switching technology with the introduction of sealed fuse products. GigaFuse™, the world’s only hermetically sealed electromechanical fuse. Both of these series are designed for high voltage and high power fuse application requirements. 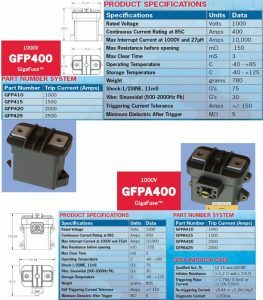 The GFP and GFPA GigaFuse™ Series includes fuse products with both passive (GFP400) and passive /active (GFPA400) combinations. This fuse technology from GIGAVAC is the first ever hermetic fuse that allows for trips to be at exact currents, not temperature or current vs time. This unique design significantly reduce resistance, eliminate thermal aging, increase system efficiency and dramatically reduce install time, complexity, and cost. Other features are: low heat generation, fast acting (can interrupt 1000 to 2500A loads much faster than traditional fuses) and it is available in a range of continuous rating 200 to 500A.